The Massachusetts food system employs more than 420,000 people via 12,000 farms and food businesses. 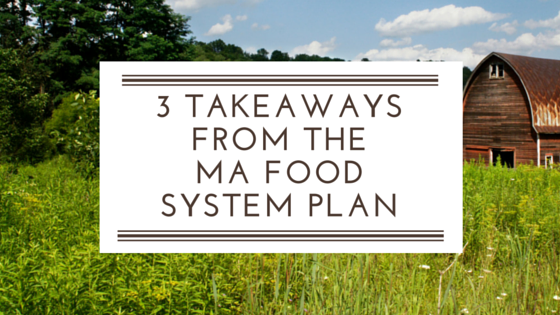 Two years ago, the Massachusetts Food Policy Council initiated an extensive, multi-year evaluation of the Bay State’s local food system. One in nine state residents are food insecure. While this is well below the national average, the total number of food insecure individuals in Massachusetts has doubled since 2000. This isn’t just about quantity of food, but rather quality of food, and specifically, nutrition. The study shows that more than 34 percent of Massachusetts residents are overweight. In 2014, MDAR’s emergency food purchasing budget enabled $780,000 of state funds to be used to distribute 1.7 million pounds of Massachusetts-grown produce. This is a great achievement, and the state should find more opportunities to get locally-grown produce to the needy. For reference, the Greater Boston Food Bank (GBFB) distributed more than 50 million pounds of food last year. While Massachusetts has a large agricultural community, access to that fresh food is a barrier for many low-income individuals. This problem is exacerbated by infrastructure and consumer-driven hurdles. The Plan identifies one barrier as a shortage of refrigeration at local non-profits; another is lack of public transit options between food deserts. What can we do about it? Take action - offer feedback! A more detailed analysis of the plan is available here. Comments on the draft plan are due by November 6 and can be submitted to Winton Pitcoff, Project Manager, at wpitcoff@mapc.org. The final results are expected by the end of the year. Click the image to tweet the article.